When I tell people that I work for the World Bank and travel all over, they are envious because I go to places on a regular basis that they dream of seeing one day. While we do jet all over the world, usually slumming it in nice hotels, we seldom have the opportunity to play the tourist. This is because our time in country is filled up to the last minute, and we hanker to get home to our families. It is Friday evening and the start of another Sabbath day. This is the 24 h period when I switch off, or at least try to, and focus on other things in life. It’s a great concept and it keeps me sane in my demanding job at the Bank. Or at least semi-sane; as a colleague’s wife says, all Bank Task Managers are mad. It has been quite the week. I’ve gone from Nanchang to Ganzhou in Jiangxi province. Bounced around roads for a couple of days, and then back to Nanchang. From there to Shanghai and Urumqi. It’s about 2000 miles as the crow flies, but the west of China is vastly different to the east where I’ve been working. 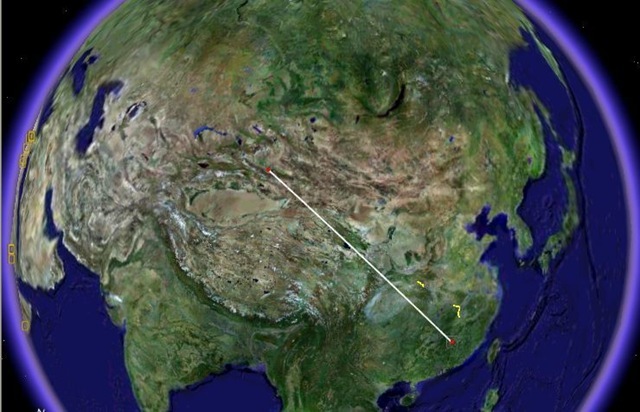 To give you and idea of just how far apart these places are, the white line in the image below, courtesy of Google Earth, shows the direct path between Ganzhou (bottom right) and Urumqi (top left). The area just south of Urumqi which looks like a brown almond is the Taklamakan Desert. A very inhospital place as its name implies: Taklamakan means “if you go in you won’t come out”. 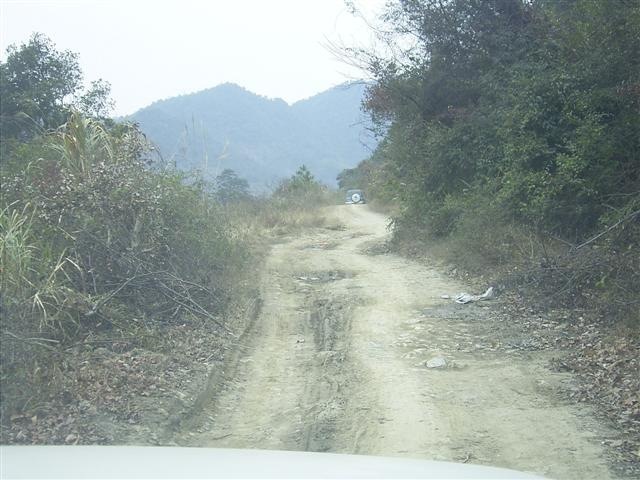 Last Sunday I did field trips to visit two rural roads that we are improving as part of the new Jiangxi III Highway Project. One of the great challenges facing China is to spread the development more evenly, particularly into rural areas where you still have many people who are living on US$1 a day. It is easy to get a distorted view of China by only visiting the major cities where you see people with money; they are still in the minority. 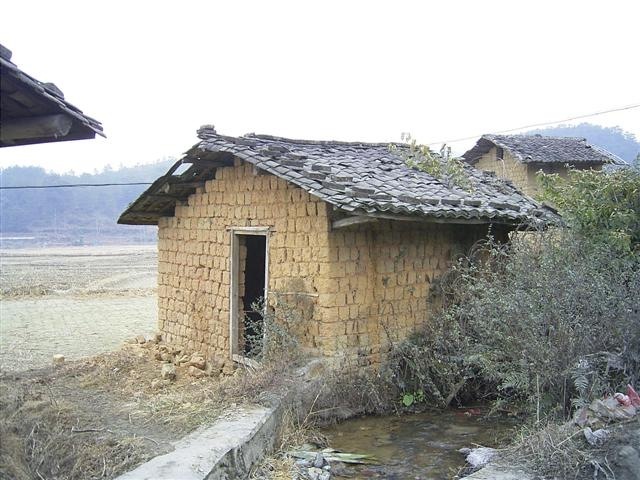 As an example of how the Chinese farmers live, the photos below show a typical rural village and a close up of one of the packed earth houses. It was around zero centigrade and the places were very dark and very cold. Not an easy life. The roads are pretty bad, as you can see from the photo below (which is not the worst section). Snaking through a very mountainous area, the condition is so poor that buses (even small ones) do not use it. As a result the local residents are even more disadvantaged since they cannot easily travel for health or economic activities. Needless to say, after travelling 35+ km on a road like that (took 2 h) I did not need any convincing that it should be included in our project. 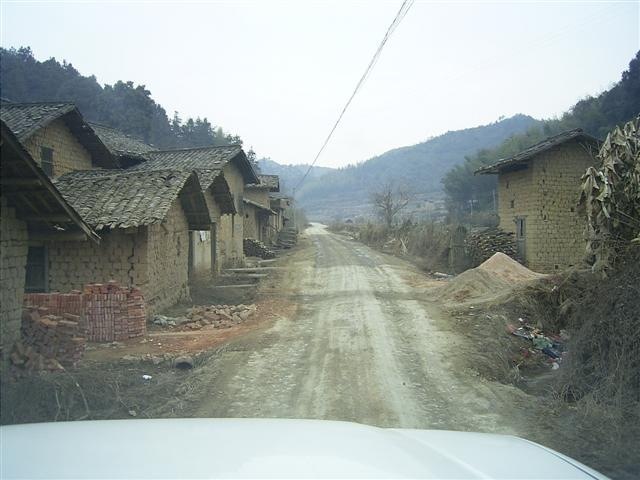 We then drove for 4 h and checked out another rural road, this one in the far west of Jiangxi, running to the Hunan border. Again, it was a winding, mountainous road, but the scenery was much nicer with trees lining the road and on the hills all around. Rural China can be very beautiful. 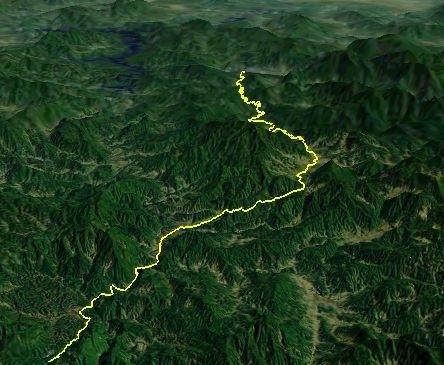 The map below gives an idea of how hilly the area was. We got back to Ganzhou about 20:00 which was a bit late for my liking. It is very dangerous driving at night in developing countries so I like to be off the road early. Unfortunately, on the way back they stopped for a banquet which I was not inclined to stay for. However, when I learned that they had invited the Governor protocol took over so I stayed. The following day we checked out the alignment of the expressway we are constructing as well as a section over to the Fujian border which is being built by someone else. The Bank has a policy that projects associated with our projects are ‘linked’ and as such subject to our resettlement and environmental policies. This is a hassle for us to manage as we have no direct control, but essential to ensure that environmentally or socially sensitive areas are not cut out of the Bank’s project to avoid our oversight. Another long day in the car brought us back to Nanchang again. One of the problems with mission travel is that although you may spend 2 x 12+ days looking at roads, all the other work builds up. This means that on hitting the hotel there are many hours spent answering e-mails, making calls, etc. to keep on top of everything. The fact I had a borrowed computer (my notebook got fried in Beijing by a voltage spike) didn’t help the matter. Tuesday we had a ‘wrap-up’ meeting where we agree on the major findings of the mission. This went smoothly. I was asked to give a lecture to the foreign affairs office but when I went there I found that it was mainly staffed with engineers from the design institute and the higway department. I did a quick change of topic and spoke on more technical issues, as well as giving a general overview of the World Bank’s operations. Since my mission was now over we had a final banquet to celebrate the end, and I was given a lovely wooden carving as a gift. It was quite large but fortunately it fit into my case, although how I managed to transplant the other stuff is still an enigma to me. The Bank has a program called ‘Development Marketplace’ where people from developing countries can apply for up to US$200,000 to fund an innovative idea. Among the ideas they have supported are proven ideas like more efficient or less expensive wind turbines to the totally outrageous such as using giant rats to identify people with tuberculosis (much faster than humans, less expensive (no lab equipment) and very reliable as described in this New Scientist article). I had agreed to be a judge for this year’s competition so I had to review 55 proposals and select the best 15. Along with two other judges we agreed on a short-list of 6 to 9. These were then put together with the short list from other teams and a final selection of projects were selected for the people to come to Washington and present their ideas to the final judges. Since I was in China I did it via a 2 h long conference call. We had an excellent moderator who really helped us and the final list that we came up with had some neat projects. I liked the self-cleaning system for a river and using plants to detoxify contaminated sites. Since the call didn’t end before 23:30, and I hadn’t packed it was a short night due to my 06:30 departure for Shanghai and Urumqi. The trip to Urumqi was uneventful, except for sitting an hour on the tarmac in Shanghai, but I didn’t get to the city until 18:00. Thursday and Friday were then spent in meetings, although I did manage a very short walk around the park Thursday night. Very short because it was -17 centigrade and I ended up deciding I was mad. As I reflect on the week it has been one of too much travel, but with that I have achieved the goals I set for the week so I’m pleased. Time now for some R&R before I head out Sunday morning for the next leg of my trip. Urumqi is located in the far west of China and is the capital city of Xinjiang Uygur Autominous Region. This was my first visit to this part of China, which is very unlike the other parts I have visited. I will write more about the city later but what struck me on arrival was snow shovelling. There had been a storm which dumped a lot of snow on the city and they were clearing the snow, by hand. Now this is a city of over 2 million people and they only have a few snow plows. So what they have done is assign a section of the city to each person, sidewalks and roads, and when it snows they have the responsibility of shovelling the snow away. If they don’t do it, they are fined. You are currently browsing the World Bank Traveller blog archives for January, 2006.